A Simple Guide - Outdoor “Potty” Training from Richell USA, Inc. 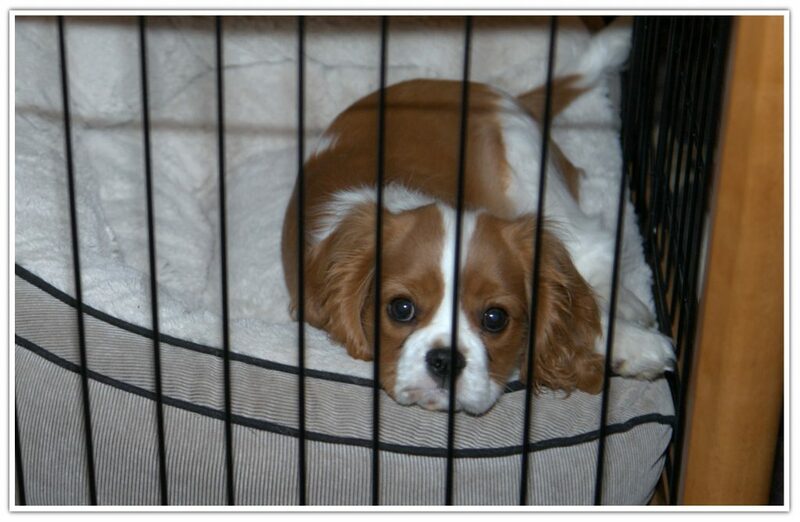 If you’ve chosen the correct pen size, your puppy will not potty while he/she is inside the crate/pen. This is Mother Nature’s way of keeping the home clean. By confining your pet to a small area, you can be certain he/she will not go until you take your pet outside. Keep in mind, however, that puppies can not physically hold it the way an adult dog can. 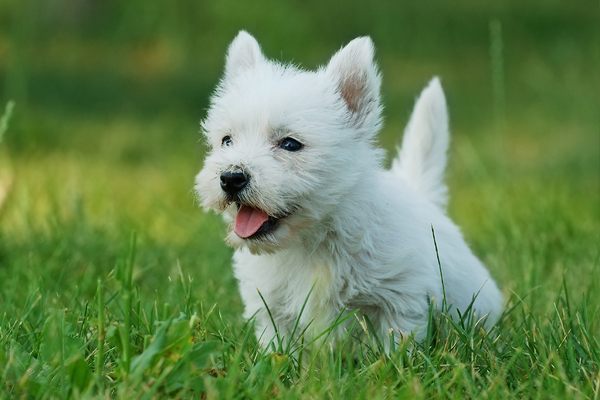 Puppies have to “potty” about every 2-4 hours, most likely right after waking, eating, drinking and playing. Begin by guiding your puppy to the door, then praising him/her at the door. Then guide your pup to a selected area outside. If your pup does not “go” within 5 minutes, bring your pet inside and place him/her back in the crate/pen. Keep taking your pet out every 30 minutes until he/she goes. Praise your pet! Then give your pup another 5 minutes to make sure he/she is completely empty. 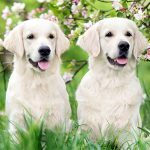 Reward your pup by giving him/her 10 minutes of supervised free time in the house before placing them back in the crate/pen. After a week of no accidents, you can slowly lengthen the free time in the house. But if your puppy does have an accident, calmly take your puppy outside to his/her “area” for a few minutes before placing them back in the crate/pen. Never scold or punish your pet! Watch your pup closely during his/her free time in the house. Sniffing and circling are sure indicators that your pup is about to go! Quickly and gently take your pup outside. At about 4-6 months of age, you can gradually leave your pup in his/her home for longer periods of time throughout the day. By the time your pup reaches adulthood, you will be able to keep the door open all the time. Your pet is now fully “potty” trained! Never punish your pet by putting or forcing him/her in the crate/pen. Never allow your new pup to roam through your house unsupervised. Always take your pet outside BEFORE placing him/her in the crate/pen. Richell pet crates and kennel are the perfect “house training” tool; click here for more product information! Perfect dog crate for your house training tool! This beautifully crafted mobile pen has lots of high-end appeal and is loaded with safety features! Find out more! 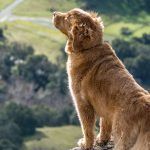 The Mobile Pet Pen 940 has made owning and training my puppy so much easier! With this pet pen I am able to efficiently put in and take out my puppy whenever I choose, while keeping him safe while he is in it. The pen has fantastic accessibility through either a spring loaded latching side door, or the two second removal of its top. Its perfectly sized and smooth rolling caster wheels make maneuvering the pen from room to room a breeze. 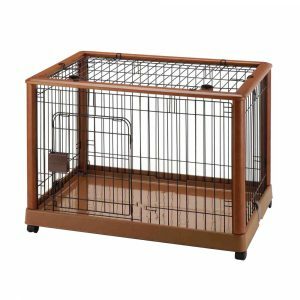 With its glossy, non-porous and very easy to clean tray, and attractive black wire enclosure with accented rich wood, this pet pen is very functional, yet supremely stylish. 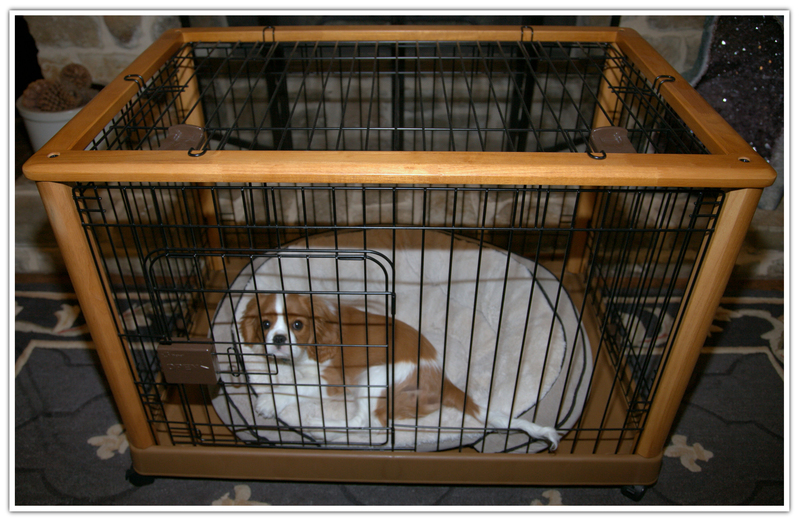 It is a comfortable size, and I can easily place my puppies bed in without any problems. The expert craftsmanship, engineering and attention to detail is amazing! I am extremely pleased with this product, and I would highly recommend it to anyone who is looking for a sturdy, expertly designed, well built and beautiful mobile pen for their pet. Thank you Richell for making pet products that not only function at extremely high levels, but that also look fantastic while doing so.